The actor Shibazaki Rinzaemon I held the name of Shibazaki Rinnosuke I from the 1660s/1670s to 1681. Dates of birth and death unknown. Son of Shibazaki Rinzaemon I, he received the name of Shibazaki Rinnosuke II and became wakaonnagata in the 11th lunar month of 1706 in Ôsaka, performing in the kaomise drama "Ebisu Otoko Onna Daigoku Hashira Gatame" which was produced by Kataoka Nizaemon I. He settled in Kyôto in the 1st lunar month of 1712 and appeared on stage for the last time in the 1st lunar month of 1714, playing the role of the keisei Kaoru in the ni-no-kawari drama "Keisei Takara no Yama", which was produced by Sakakiyama Shirotarô I in Kyôto. 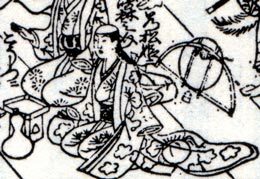 His rank in the 1714 Kyôto hyôbanki, wakaonnagata section, was (shiro)jô. We don't know what happens to him afterwards for he disappears from the records. Dates of birth and death unknown. Disciple of Shibazaki Rinzaemon I, his first stage name was Shibazaki Kodenji. He became wakaonnagata in the 1st lunar month of 1712, playing the role of Hayazaki in the new year drama "Shida Yuzuriha no Kagami", which was produced by Ogino Yaegiri I and Miyazaki Denkichi in Ôsaka. He went to Edo in Fall 1715, playing the role of Princess Hanateru in the kaomise drama "Banzei Onna Hachinoki". He took the names of Shibazaki Rinnosuke and Shibazaki Rinnosuke III in the 11th lunar month of 1716 and 11th lunar month of 1717, at the Ichimuraza, where he played in the kaomise dramas "Yoroi Kurabe Ôshû Gane" and "Kinkazan Yoroi Biraki". The latter performance was also his last-recorded one. We don't know what happens to him afterwards for he disappears from the records.